LUCY BURDETTE: In 2007, my sweet husband retired from his regular job and moved home to start a website for Baby Boomers trying to figure out where to retire. As most of you know, I’m a writer. And I had grown accustomed to having the house to myself, except for the pets. In other words, lots of space—and peace. On that first day, he clattered up from the garage with boxes crammed with file folders and photographs and mementos from trade shows--all the junk packed up from his previous office, which he proceeded to unload in the dining room. his desk, I kid you not! I caught him spreading his computer and piles of other miscellany out on the dining room table—the first thing every visitor to our home would see. After some more heated discussion, we agreed that he might enjoy sitting out on the porch—a nice view for him and out of sight for me. “But what will I do when it gets chilly?” he asked. Besides that, he’s developed his idea into a major retirement website (with 20,000 subscribers to his weekly newsletter), having written thousands of articles about every aspect of retirement ranging from all kinds of best places to retire lists (best towns for bookstores, best places for walkability, etc.) 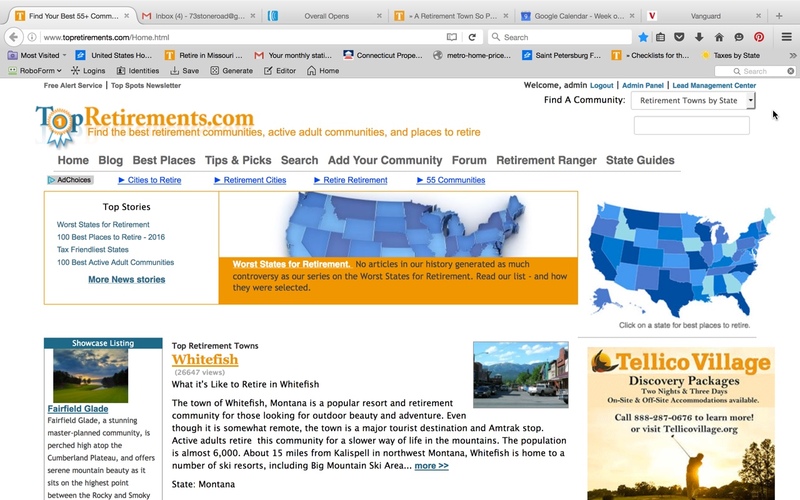 to when to start taking Social Security, over 4,000 reviews of places to retire. I’m very proud of what he’s done and thought you might like an inside look. LUCY: When you started out, how were you imagining the shape of the project? Are you surprised at how far you’ve come? JOHN BRADY: I wanted it to be a project available on the Internet and pertinent to baby boomer retirement, since I am a Boomer and I had just retired from my longtime job. My initial goal was a little vague: Get it started and see what happened. The process of conceiving it and watching it become a real website with real people coming to visit has been really fun. My financial goal was that if it made enough money to pay our taxes that would be great. It turns out that lots and lots of people found it useful. We get over 140,000 visits a month and sometimes close to a half million page views - that is pretty good. And the revenue is a lot better than I ever imagined. Pretty lucky. LUCY: how about sharing some advice about the process? What were some big turning points? Or ideas you had that didn’t pan out? JOHN: My previous experience in online publishing was a big help. Without a disciplined process of putting down on paper what each web page would look like, and how each page would lead to the next in the navigation, the project never would have gotten anywhere. To save money I outsourced the technical development to a firm in India. I had to imagine and write down every detail very precisely, because they, or no one really, can read your mind. It was a great exercise in imagination and in follow-through. Of course sometimes I was way off, but the team was able to either interpret or suggest a better way. I thought that most of my revenues would come from active adult or 55+ communities purchasing enhanced listings. Turned out that Google Adsense was a much more important revenue source, and easier. I also had a lot of ideas for developing other sites - BestAssistedLiving.com, BestPlacesinUSA.com, etc. Although I thought they were great ideas, not many visitors agreed! They still exist, but they are only marginal compared to Topretirements. What I learned from that is that getting a big idea is lucky - enjoy it if you are fortunate enough to get one! Hackers are a problem I didn't foresee. Having been hacked several times, I’ve learned there are people in Russia and China whose full time job is trying to hack into successful websites, either to steal traffic or plant malware. Finding a web developer who can successfully defend against these villains is absolutely critical (I have been lucky to find one, this time in Connecticut, not India). LUCY: I know this is impossible, but can you give some quick tips about how to figure out the best place to retire? And maybe some links to a few of your favorite articles? It contains short checklists which are designed to help you (and your significant other) narrow down the other possibilities. Thanks for having me. Jungle Red Writers has given me a lot of reading pleasure over the years, keep up the good work! And if you'd like to sign up for the FREE Top Retirements weekly newsletter, here's the link. Wow . . . I only glanced through some of the information on your website, John . . . it’s quite amazing. What a great service for folks wondering when and where to retire . . . .
Amazing site, John. I'm hoping I get to use it on a more personal level soon! This is so fascinating! At my age :-) I have learned how valuable it is to see this time of our lives as wonderful new chapters, not as an ending. John, it's fabulous for you to allow people to feel comfortable ( and not alone) on their new paths. As for the dining room table situation, I think it would be hilarious to have a surprise moment where we all have to take pictures of our dining room table. Mine is an epic fail right now, covered with things I have to mail, and things I have to file. Reds, Thanks for looking at the site and for your kind comments. Edith, my most predominate advertisers are active adult and 55+ communities. Adsense is really great and easy. Once approved you just put the code on your pages and the ads start showing up, matched to your content. The only drawback is that Google is very strict and acts like the Wizard of Oz. They will not speak to you, everything is quite mysterious and devoid of human contact. thanks for the link tip Edith--I've been working on this blog for years and never figured that out! Top Retirments is part of my morning routine, like Reds. Learning how a wide range of people decide where, and how, to live in retirment is fascinating. My reactions tend to fall into two categories: are they crazy?? ?, or what a good idea! Many of us seem to have arrived at retirement with vague ideas of what comes next. TR is a great resource to turn vagueness into a concrete plan. One thing we have deinitely decided we do not need in retirement is a dining rooom, which tends to serve as a warehouse for whatever proejct we are currently involved in. My husband recently got is AARP card - and he should start thinking about "what's next?" Actually, both of us, as we'd like to ditch the 9-5 when The Boy graduates high school and we no longer have the tuition bills. On the one hand, that's four years away and it seems so long. On the other, I know how short four years is (The Girl is starting her junior year of high school - ack!). I LOVE that web site! Even though I'm not getting ready to retire it's fun to dream. And I love John's story. He is one of the calmest, nicest, most sensible people I've ever had the privilege of knowing... so NOT one's image of a dot-com entrepreneur, and yet he is. Hi Mary. You and the hub are smart to be thinking ahead to retirement. Planning pays off in terms of a happy experience. Too many folks retire without an idea of what they are going to do, where they live, or what their finances will look like. They retire too early, often without enough savings. For example, 1 out of 4 retirees wish they would have waited longer to take Social Security. The Center for Retirement Research says that slightly more than half of retirees will face a decline in their living standards. So plan away! Now is a good time (after Hallie's comment about calmness) to tell a John Brady retirement story. At first, he was thinking he'd be a good consultant to other folks who wanted to increase their web traffic on their sites. He finally got a good lead on a customer...but when I heard him shouting at the customer about his lack of payment (from the upstairs office), we sort of realized he wasn't cut out for this path. And so Top Retirements was born! Hi, John! Welcome to our merry band of mystery lovers! My husband started drawing SS this past winter, and I just got my Medicare card (gulp), and am currently wrestling with which supplemental plan to choose. It's such a complicated time, and I can see why your site is so popular! I will be diving into the various categories later. Thank you, and thanks, Lucy, for sharing your darling man with us today. Yeah. We don't want a the traditional view of "retirement" - two people sitting around. We'll be doing...something. Not sure what. But he'll have SS (I'll have it eventually - I'm 10 years younger than he is). He'll have his military pension and his Federal pension. We've both got savings. The house is paid for, so no mortgage. That's good. This looks terrific. We've made our decisions, but there are hordes of boomers approaching retirement age. I predict this website will be even more successful! How much time does it demand now? How did you find the CT firm that could help with hacking? Oh, it was such a dilemma deciding whether to take SS or wait! I decided waiting was the optimistic choice. We shall see! Just a quick comment to say that when I began exploring not necessarily retirement but a reassignment of my priorities (where I wanted to live, how I wanted to earn money, how I wanted to live during what I hoped would be the best chapter in my life), I began at John's website. I can't even begin to tell you how much I learned from him and from the other people who share their experiences. The result was several exploratory trips (Maine, Hidden coastal Florida, Cape Cod) which were adventures in their own right. The best lesson I learned was to embrace the idea of change and see it as exciting, not something to fear. Kudos to John and his fabulous website. John, what a wonderful success story - and an important reminder that you shouldn't necessarily retire from all work. The happiest retirees I know are ones who have started second jobs, become self-employed, or have thrown themselves into volunteering or a creative hobby. Argh! No wonder I want to start drinking whenever we talk about it. We love where we live, we adore our old house, our town, our proximity to a great city--and we are next door to our daughter and granddaughter. But the upkeep on our house enormous. So. Hmmm. You've given me a place to start. Thanks everyone, it is such a nice feeling that I have been able to help a few people. My fans make it great for me. Finding good people to work on the web is not easy. Fortunately I was able to hire someone who freelanced for my previous company - he puts in 1 day a week for me, which is about perfect. Waiting for Social Security is the optimistic choice, and usually the best one. Every year you delay from age 66 to age 70 you get an 8% increase for the rest of your (and your surviving spouse's) life. Plus the COLA (however meager these days) is added to that. Breakeven is somewhere in your early 80s. Life expectancy at age 65 is about 20 years (slightly more for women, less for men). But if you really need the money and think your life expectancy is less, go with the early claiming option. Thank you, John. You provide an invaluable service to me and to the rest of your readers. I also appreciate you editing your blog so discussions don't tangent off topic. thanks Jan--I know John really appreciates your contributions to the site too! What a helpful, comprehensive web site. I relied on a little help from friends, and the kind people at the Social Security Office, and the benefits department of my former school district, to get securely set up. I considered relocation, and decided I like the community, just needed to move from a noisy condo to my own home, built with help from a good eco-broker. I also decided my "second chapter" was, not a full-fledged storytelling career (though I still do the occasional performance) nor teaching for the Y, but a return to full-scale reading as done in the wonderful summer vacations of my school years, vicariously enjoying the adventures of Key West, Ft. Lauderdale, Boston, England . . . and further. Like Thoreau, loving "a broad margin to my life." An acquaintance commented when her husband retired, "I married him for better or for worse, but NOT for lunch!" Lucy, thanks for sharing John with us today. John, I am thrilled to now have your site and those links to take a look at. I know my husband and I aren't as prepared as we need to be. He's still working, but he will probably retire in another year or two. I've already stopped working. My daughter and her husband, early thirties, are great examples of starting early on planning for retirement. They know exactly when their house will be paid off and save money and are very organized. I'm not sure my son, who is 29, looks much at the future yet. John, clicking around your site, I noticed you don't have much about Ohio (except a fairly weak "worst" rating), and nothing about Cincinnati. I invite you to come and visit, and I'll show you why it would merit inclusion for at least a mention on your state map! I'm going to read every one of these articles. Maybe it will help us figure it out. What a fabulous site!